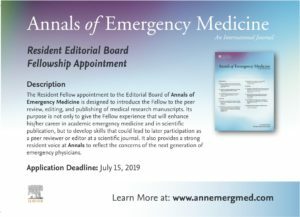 The Resident Fellow appointment to the Editorial Board of Annals of Emergency Medicine is designed to introduce the Fellow to the peer review, editing, and publishing of medical research manuscripts. Its purpose is not only to give the Fellow experience that will enhance his/her career in academic emergency medicine and in scientific publication, but to develop skills that could lead to later participation as a peer reviewer or editor at a scientific journal. It laso proves a strong resident voice at Annals to reflect the concerns of the next generation of emergency physicians.